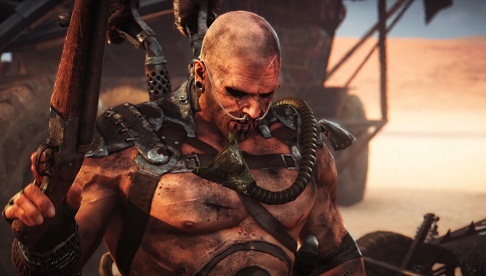 In Mad Max, SCROTUS and his War Boys are your main enemies, because they attacked at the beginning of the game and rob Max. But who is SCROTUS / War Boys? Those who watched the movie Mad Max: Fury Road already knows the name "Immortan Joe", "Rictus Erectus" and "War Boys". And for those who don’t know the movie: Immortan Joe is the supreme villain of the film, a cruel tyrant, who has built a thriving fortress called Citadel in Wastelands and there is a good life thanks to water gardens and private harem while hordes of beggars starving at the gates of the fortress. Since Immortan Joe and his sons Corpus Colossus and Rictus Erectus never could prevail alone on the Citadel, they have recruited an army of fanatical followers, who would die willingly for their masters and leaders Immortan Joe: The War Boys. The War Boys believe in the cult of the V8, which is a vehicles and mainly engine that worships and their big goal is to die spectacular in battle. Then they expect a perfect life according to their faith, where they can eternally boards on the cobbled streets of Walhalla with chrome. And since most War Boys already suffer from one or another deadly form of cancer, their lives always short and painful. Hence the cult of the V8 is a safe stop for many wasteland dwellers who try already there to accommodate their children as so-called "War pubs". When a War Boy sees a chance at a particularly spectacular death, it is his face and his teeth spray with chromium and urging his comrades to witness his death. A sure sign that he immediately comes to Valhalla! War Boys shave their hair, rubbing their bodies with a white powder and tattooed engine components to the skin. Immortan Joe has three sons, the conjoined Corpus Colossus, the large but pretty stupid Rictus Erectus and the psychotic Scabrous SCROTUS. And unlike his brothers and his father SCROTUS has terrorized and plundered, while the events of Fury Road pass through the wasteland with his gang particularly nasty War Boys. After the final fate of Immortan Joe and Rictus SCROTUS came back from rampage and took over the place of Gastown Joes henchman People Eater, who was killed in the course of the film. Since SCROTUS prevails as a brutal warlord over the entire region around Gastown and his War Boys are ultimately responsible for the incident at beginning of the game that Max loses his car and almost his life.